Between 10,000 and 50,000 civilians are trapped in Raqqa without food or fresh water. Food access in Raqqa is now at ‘a critical turning point,’ aid organisations said Monday. The assault on the ISIS-held city is a joint operation by the International Coalition and their partners on the ground, the SDF. The UK is a leading member of the Coalition. The Coalition, including the UK have a responsibility to do all they can to protect civilians caught in the fighting. 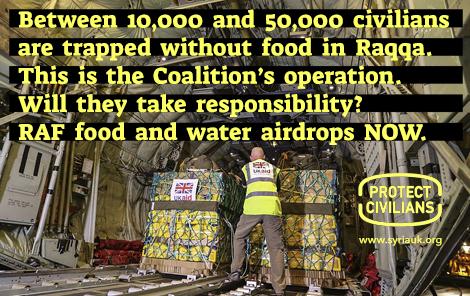 The UK should organise RAF airdrops of food and water to trapped civilians NOW. Protecting civilians is both a moral imperative and also a strategic necessity in order to defeat extremist ideologyof ISIS and Al Qaeda. 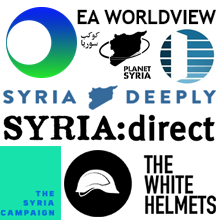 On 11 January and again on 22 February, Secretary of State for International Development Priti Patel told the House of Commons that the Government was ‘examining all options for getting aid into besieged areas in Syria,’ including the possibility of using drones to deliver aid directly. In Raqqa the siege is being imposed by the Coalition, not Assad, and the UK’s responsibility to act is unquestionable. 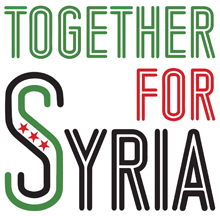 Government ministers directly concerned with Syria such as Tobias Ellwood and Alistair Burt are proud of the UK’s record on Syria aid, amounting to a commitment of over £2.46 billion. In Raqqa however, the UK has a direct role in the circumstances of people’s suffering and has the capacity through airdrops to provide direct relief. Will the Coalition and the UK Government in particular now live up to their responsibilities? The choices they make now will be remembered by Syrians for a long time to come. The UN estimates 20,000 to 50,000 people remain inside Raqqa city. REACH Initiative estimates between 10,000 and 25,000 civilians remain trapped. Since the start of the International Coalition’s final assault on the ISIS-held city, many thousands have escaped, despite ISIS minefields and Coalition air attacks. Hundreds of civilians have been killed or wounded by artillery and air attacks. According to REACH Initiative, the many thousands of civilians still trapped now rely entirely on whatever food stores they have saved. Refrigerators don’t work because there is little or no electricity. Bread is no longer available anywhere in Raqqa city. Residents can no longer access water from the Euphrates River because of the tightening siege. Residents rely almost exclusively on neighbourhood boreholes, many of which have been dug recently. These produce limited amounts of water due to insufficient electricity to run boring machines and water pumps. The water produced is also reportedly not fit for drinking, according to REACH. According to REACH, informal clinics set up by civilians and not staffed by professionals are reportedly operating in a very limited capacity in the central neighbourhoods of Raqqa. They have only the most basic of medical supplies. Airstrikes and reduction in critical supplies are the greatest threats to the safety and well-being of those remaining in Raqqa, REACH reports. Monitoring organisation Airwars estimates that at least 340 civilians in Raqqa were likely killed by Coalition strikes and artillery in June. As many as 119 children were among those killed since June 6th.